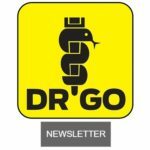 The Doctor will school you now. The “AR-15” is the common name for a style of semi-automatic rifle which is perhaps the most misunderstood firearm in modern history. To listen to gun controllers, one would think that this style of firearm had emerged from the depths of hell, become sentient, and started attacking residential subdivisions across the country. I am here to attempt to explain in layman’s terms what this firearm is, why it is so popular, and to dispel ignorance and myths about this useful rifle design. 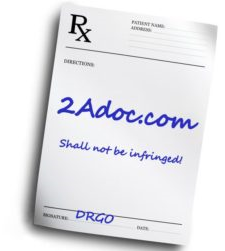 The main caveat is that I am doctor not a gunsmith. I am merely an owner and enthusiast of this style of rifle. I have shot my own versions many times for recreation and in competition. I have torn down and reassembled them myself on many occasions. I should also note that my particular rifles spend their evenings locked up in my safe to prevent them from escaping and terrorizing the neighborhood at night. Which is more than I can say for several neighborhood dogs. The “AR” is NOT, repeat NOT a “weapon of war”. Why? Current military rifles are select-fire – the gun fires a burst or continues to fire as long as the trigger remains depressed until all the ammunition is gone. There are already restrictions in place on fully automatic firearms, and there have been since 1934. The AR-15 is a SEMI-automatic rifle – one pull of the trigger results in one shot fired. That’s all. It is NOT a “military” weapon. Semi-automatic firearms have been around for well over 100 years. There is nothing new or insidious about the mechanics of semi-automatic firearms. People have used them for generations, and it is the dominant style of firearm in current use. The AR in AR-15 stands for “ArmaLite Rifle” – which is the name of the company which came up with the original design in the late 1950’s. Armalite subsequently sold the rights to Colt, which went on to manufacture the full-auto military version. “AR-15” has become the popular generic name for the style of rifle, but the AR does NOT stand for “assault rifle”, and average citizens may only purchase semi-automatic versions. Here is a timeline for those who may be interested. The reason for the popularity of this style of rifle is its modularity. Parts can be swapped out for different versions with relative ease. 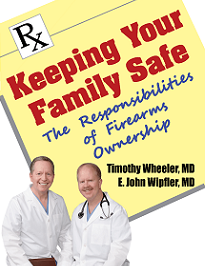 That means that the average gun owner (or pediatrician) can make his or her own cosmetic modifications without paying a gunsmith to do the work. The problem is that those cosmetic modifications are widely misunderstood by the non-gun owning public. 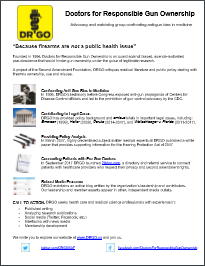 Many people (including lawmakers) who are ignorant about how firearms actually work, assume that those cosmetic features somehow make the rifle more “deadly”, when in reality, nothing could be further from the truth. None of the features that “define” an AR in the public’s imagination change the way the firearm functions. The internal mechanics remain the same as any other semi-automatic firearm. An analogy would be to say that just because you’ve added racing stripes to a car’s paint job, and hung fuzzy dice from the rear view, doesn’t mean that you’ve done anything to actually make the car go faster. 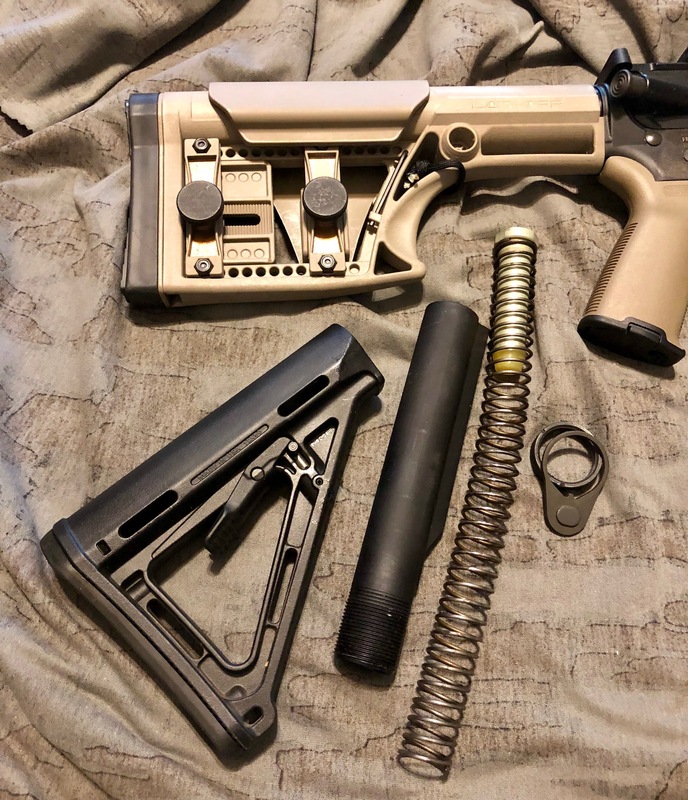 One of the advantages to modularity is that the AR is easy to disassemble. It is composed of two main parts–the upper receiver and the lower receiver–which separate by pushing two pins. The reason this is advantageous is that many uppers and many lowers are interchangeable, allowing flexibility for different uses. For instance, I have a whole separate upper receiver designed for a slightly different caliber ammo, so that I can use the gun for hunting large game. I just pop one upper off, and pop the other upper on, and I’m ready to transition from target matches to deer season. Additionally, I have a bolt adapter (an internal part that slides into the gun) which allows me to shoot an even smaller caliber of ammo for steel target matches. Thus, my particular AR–with the right parts–allows me to shoot three different calibers of ammo for three different types of shooting, without having to own three separate rifles. I’ll now attempt to explain some of the cosmetic features, and why they make for a popular and useful rifle. The adjustable stock was one of the features singled out during the failed “Assault Weapons Ban” of the 1990’s. This feature simply allows the firearm stock length to be adjusted to fit different size users. In other words – it can be made comfortable for the arm reach of a small-to-average size woman like myself. Without an adjustable stock, I would be forced to find (and pay) a gunsmith to saw off and reshape a solid stock to fit me. Because of the AR’s modularity, I was even able to perform a swap-out of one style of adjustable stock for another – all by myself. Banning adjustable stocks sounds a bit silly and even sexist now, doesn’t it? This feature was also on the banned list. There is nothing nefarious about a pistol grip. It is simply a chunk of rubber or plastic which allows the user to keep a firmer hold on the firearm. Maintaining better physical control of a firearm sounds like a safety feature to me, not something “dangerous”. 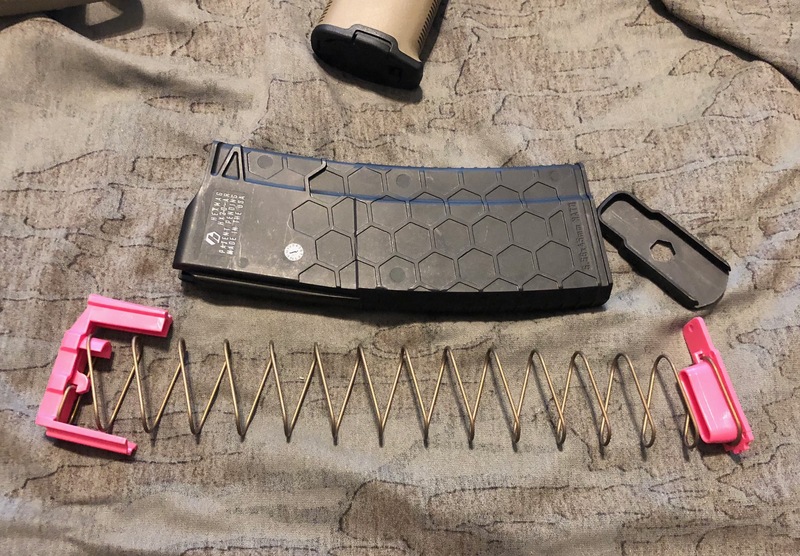 I have personal experience in swapping out the pistol grip on my rifle for one of a different color (an operation performed at my kitchen table), and I can confirm that this piece of hollow plastic isn’t any more “dangerous” than a doggie chew toy. This is yet another feature that was on the banned list. Though the word “shroud” certainly sounds menacing, another name for this component is “hand guard”. The purpose of this feature is to keep the user from burning their hands on a hot barrel, because firing a gun generates heat. There is nothing dangerous or evil about keeping someone from burning their hands. In a traditional style rifle, wood serves that purpose. 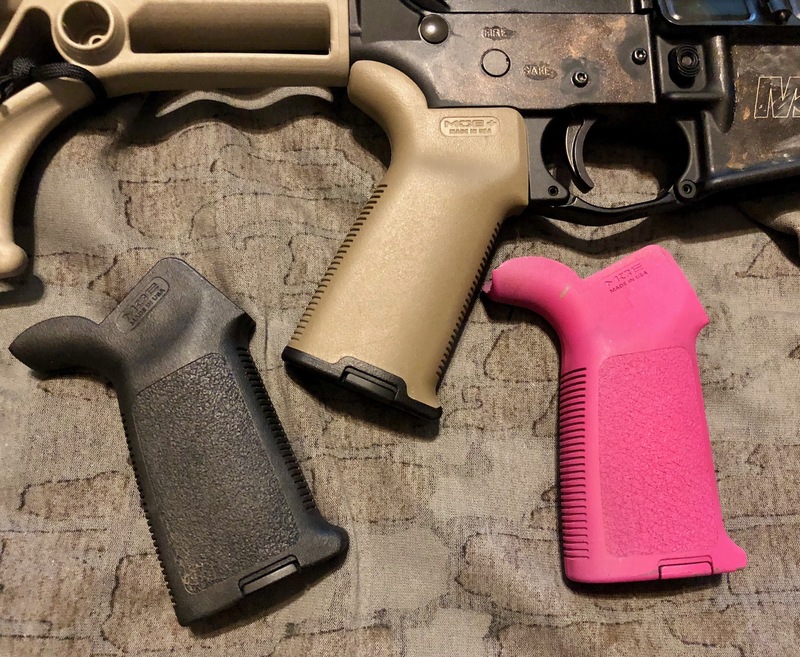 Modern hand guards are now available in a variety of colors, designs, and materials for those who like to personalize their firearms (like me). This is another previously banned piece of metal. Its only purpose is to reduce the amount of flare/flash that comes out of the end of the gun when it is fired. That flash can sometimes interfere with the shooter’s vision in lower light conditions. I consider this one to be a safety feature as well, as you never want a shooter’s vision to be obscured. It in no way makes the firearm more “dangerous”. A magazine is nothing more than a spring-loaded tube that pushes ammunition upward into the gun. It works almost exactly like a Pez dispenser. A magazine is composed of a square-ish hollow plastic tube, a spring with plastic on both ends, and a bottom sliding lid to keep the spring inside. That’s it. Nothing evil there either. 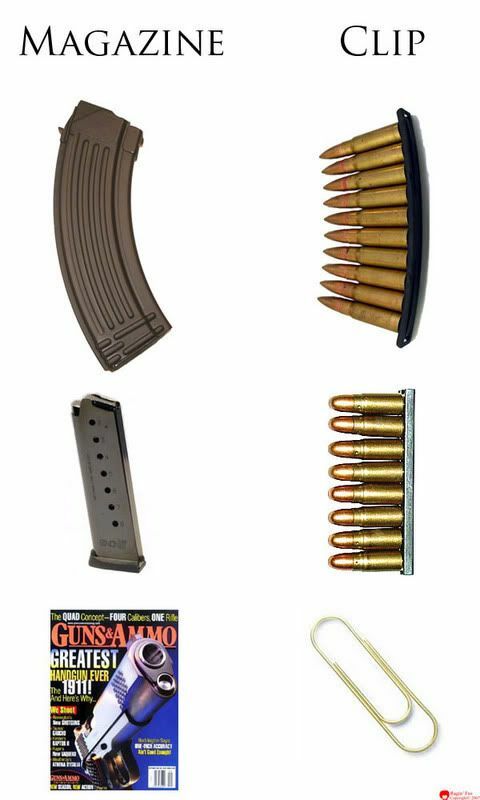 The capacity of the magazine doesn’t mean a whole lot because with a little bit of practice changing magazines can take about 2 seconds (even less if you are a competitive shooter). That means that in place of a standard 30 round magazine, using three 10-round magazines would take only 4 seconds longer to fire the same number of shots. The colloquially named AR-15 is NOT a “military” rifle, or a “weapon of war”. The AR-15 style rifle has been around for some sixty years, and semi-automatic firearms in general for over one hundred years. “AR” stands for ArmaLite Rifle, NOT Assault Rifle. The AR-15 functions like every other semiautomatic firearm. 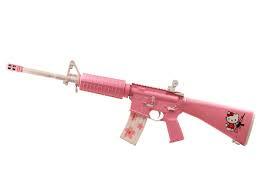 The external modifiable features of an AR-15 do NOT make it any more “dangerous” than any other semi-automatic rifle. Those external modifiable features DO however make the AR-15 more comfortable, more safe, and more user-friendly for people of all different sizes and body types, thus making the AR-15 the most popular rifle style in America.